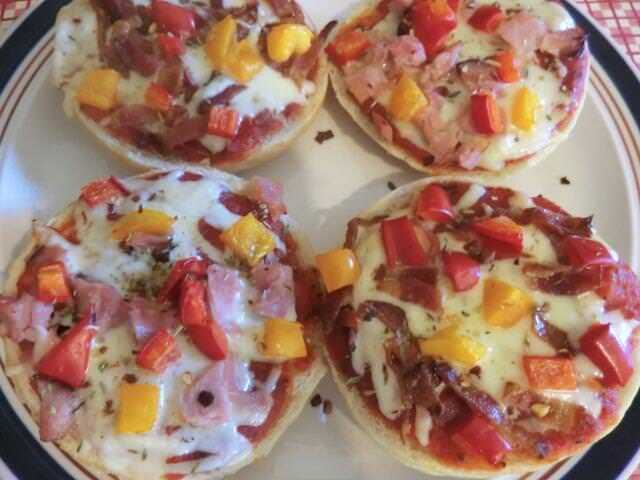 snacks | Cooking is Fun … Really!! I finally got a chance to make a batch of these sweet dough bread pockets using the recipe posted on The Frugal Hausfrau‘s blog. 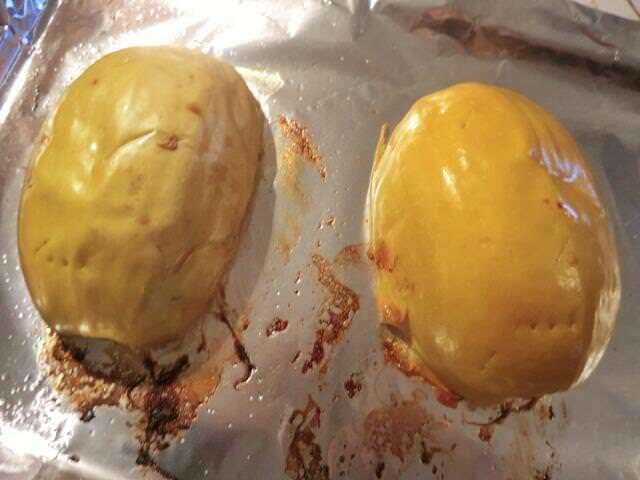 Besides using leftover shredded sauerbraten instead of ground beef and adding about half a cup of grated old cheddar cheese to the filling once it was cooled, I also tried an alternative shaping method. It didn’t make the assembly much faster although the seams didn’t open up as often. 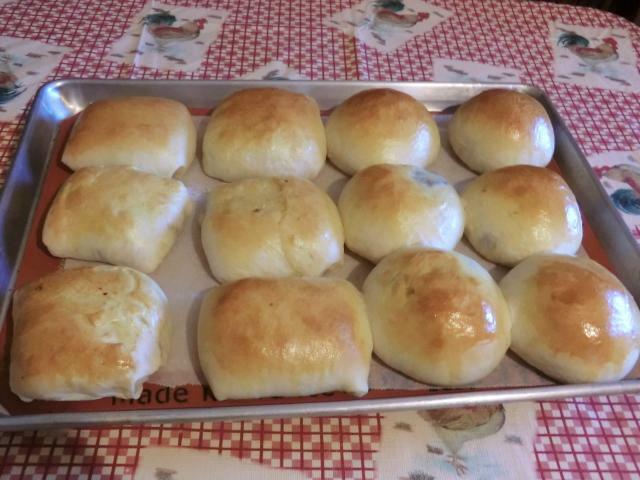 Review: The recipe estimated being able to make a dozen runzas but I ended up with fourteen, and still had filling left over, so I’d cut back on the amount of cabbage used from about four cups to 2 1/2-3 cups in the future. Making the filling the day before, so that it has a chance to cool, is also advised. 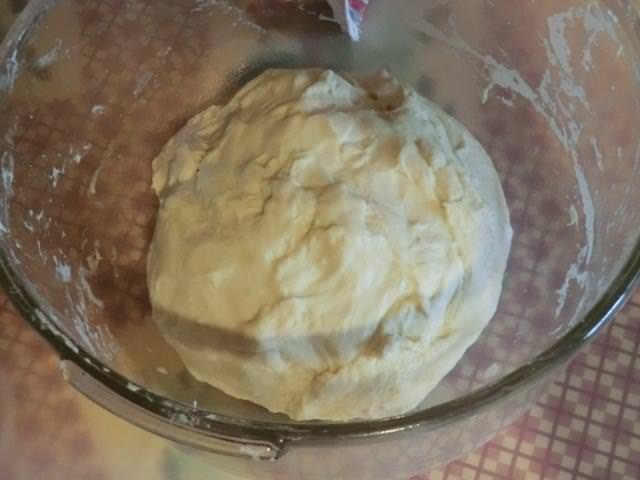 On the whole though, the dough was simple to make and the results were quite tasty. My shaping, especially on the square runzas, needs work. 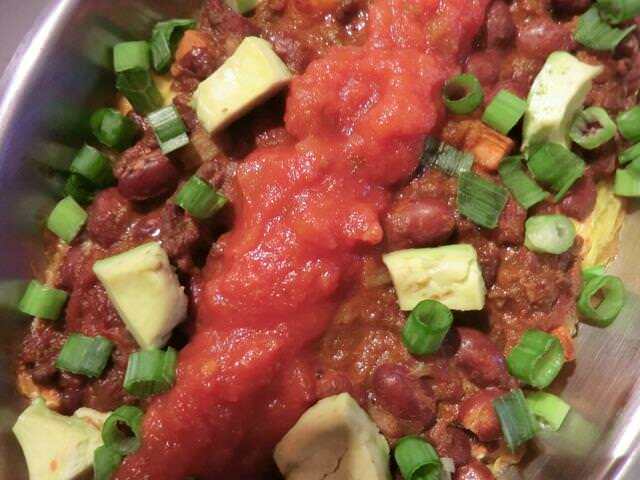 ETA (01/02/2019): If you don’t want to use ground beef, try ground chicken or turkey. Or even pork. 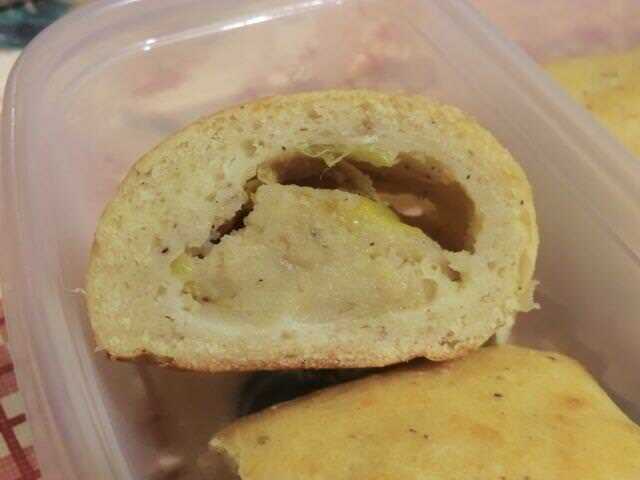 Leftover leeks in the fridge, potatoes sprouting in the basement and a four day stretch at home recovering from a cold, meant I had the ingredients and all the time needed to try a second knish recipe. I started with Chef Bryan’s recipe on the Klondike Potato website but had to make some changes. Mostly to reflect the shaping technique I used. 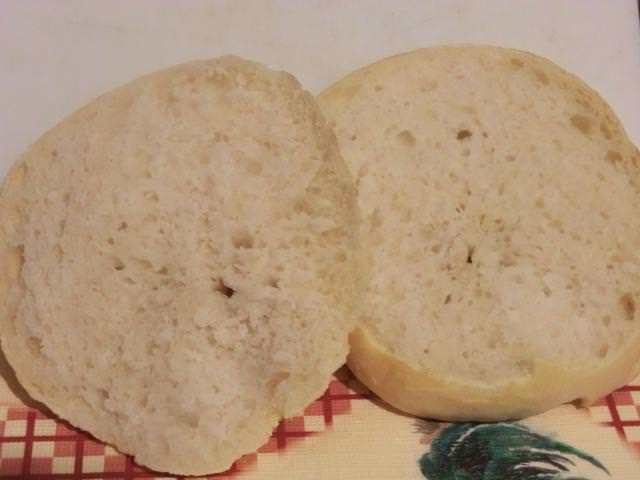 I had some concerns about the amount of salt called for in the dough, as well as the filling, and it turned out that my fears were warranted, as the filling was saltier than I would have liked. 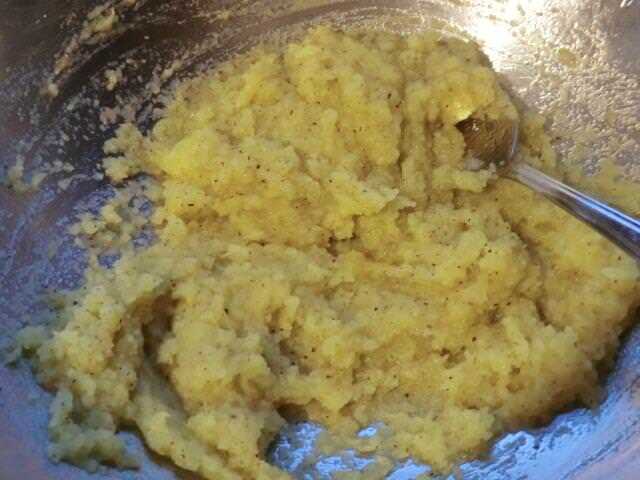 When cooking potatoes for mashing, I usually throw two generous teaspoons (using a disposable plastic spoon not a measuring one) of salt into the boiling water, which may have contributed to the excess salt taste. And, rather than sauteeing the leeks and the onions in butter (unsalted, though the recipe didn’t say), I used margarine. If I had been thinking, I would have added more mashed potato to the filling I was making to dilute the salt but, obviously, I was NOT thinking. In my defense, I was also trying a new meatloaf recipe at the same time so I was distracted. 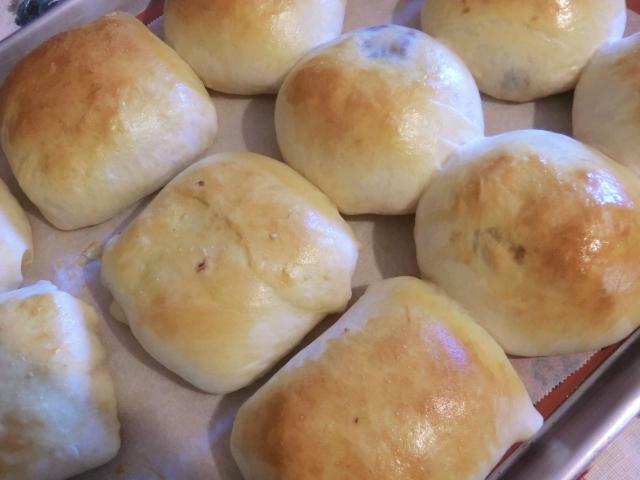 Rather than making individual square knishes, I tried to replicate the beef filled version my mom used to bring home from the deli where she worked for twenty years. They made two/two and a half inch wide meat filled logs which were baked and then cut to size for serving. It turned out that I had too much dough (or conversely, not enough filling) as a result of changing the shaping method. In the recipe below, I’ve doubled the filling ingredients to accommodate this. 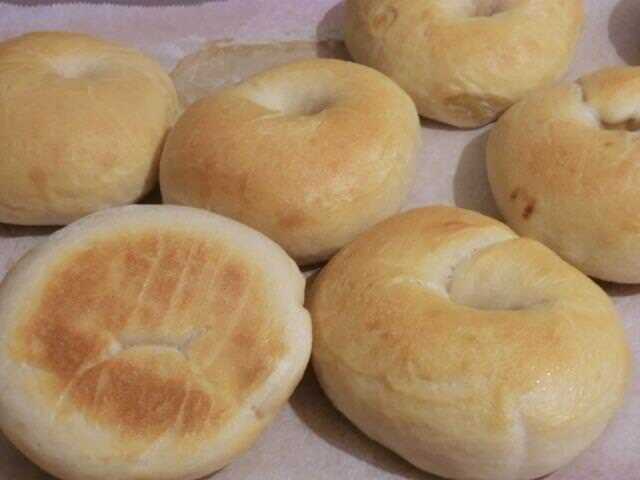 Aside: About half an hour after my knish roll came out of the oven, I had the curious thought that I may not have measured out three cups of flour for the dough, but only TWO. 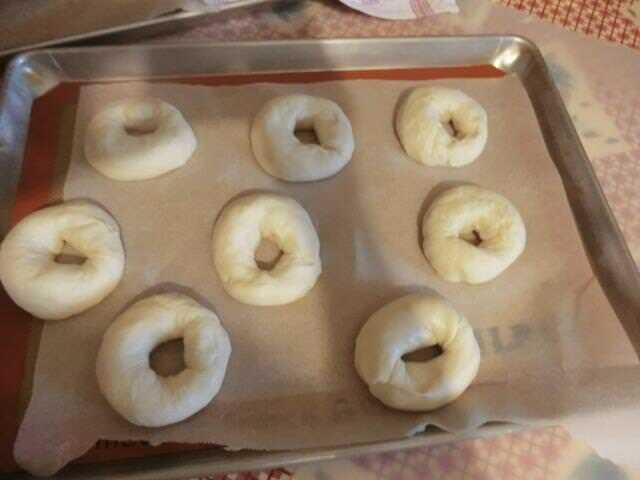 Prepare a half baking sheet by lining with a sheet of parchment paper. 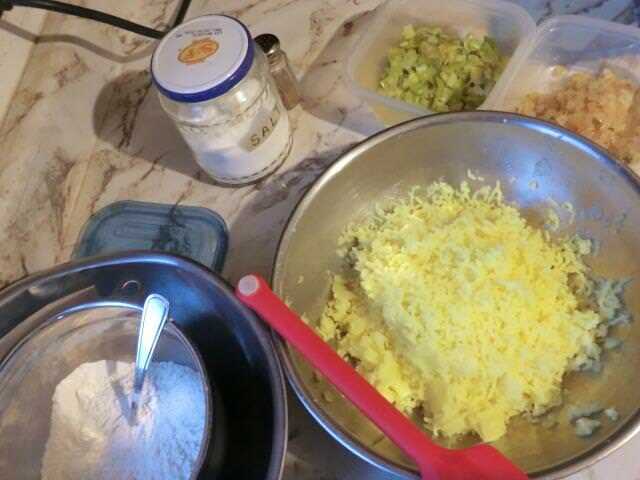 Whisk together the flour and baking powder in a small bowl and set aside. Combine 1 cup of mashed potatoes, salt and pepper in a large bowl. 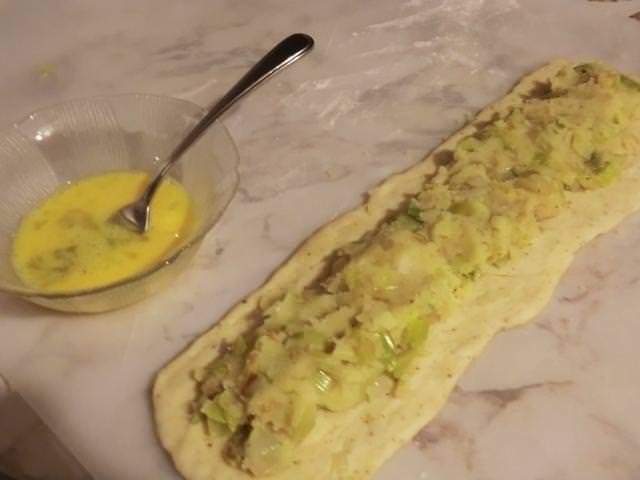 Whisk in the olive oil and mix well until nice and creamy and the potatoes come together. 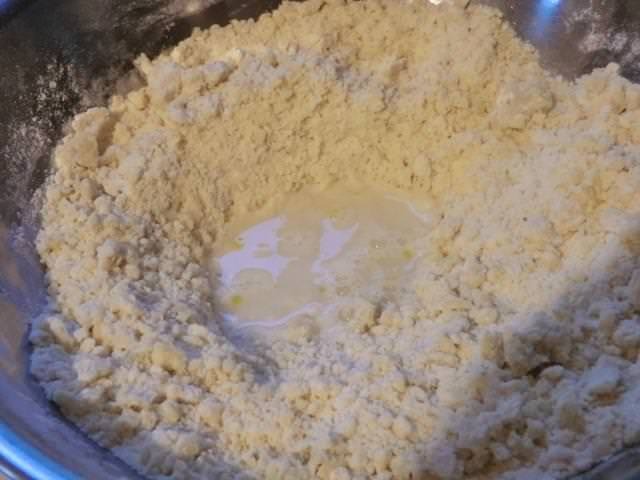 Add the dry ingredients to the wet. Mash together. It won’t come together yet. 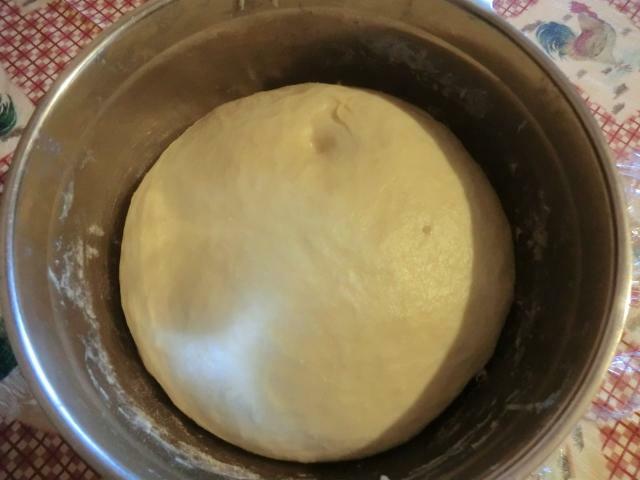 Add the water to pull it into a dough by creating a well in the middle and adding the water. 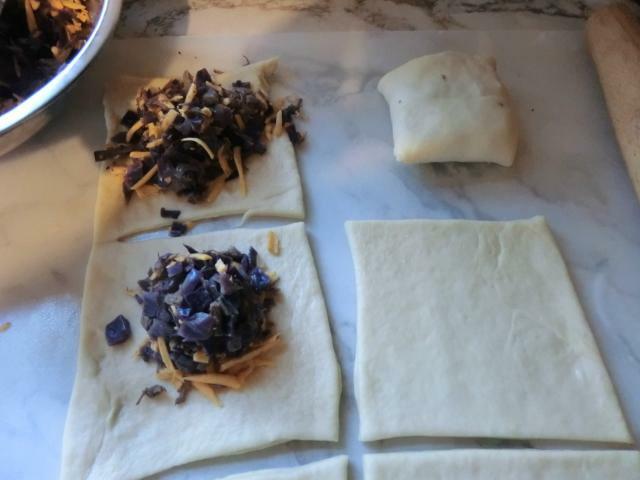 Mix together until it comes together into a soft dough. Cover the bowl with a cloth or sheet of plastic wrap and let the dough rest for about 30 minutes. Make the filling during this resting period. In a large saute pan, fry the onions with some (1 tbsp) of the unsalted butter until softened, but not caramelized. Transfer to a medium sized bowl and set aside. In the same saute pan, fry the leeks with the rest (1 tbsp) of the unsalted butter, until just softened. Add the leeks to the onions sauteed previously. Add one cup of mashed potatoes to the onions and leeks, as well as the salt and pepper. Stir well to combine and set aside. Lightly flour a clean work area. 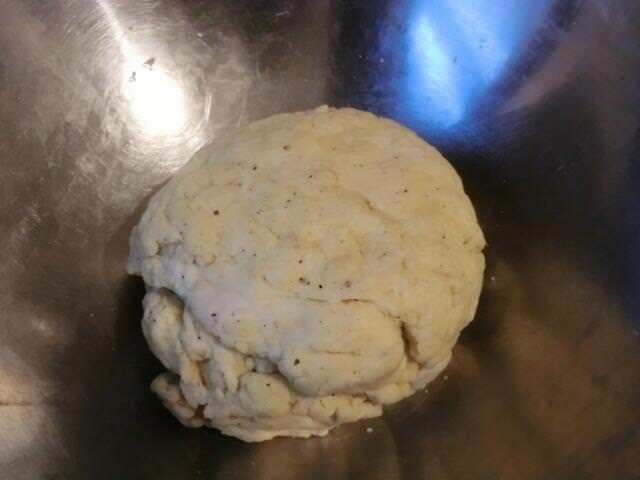 Take your dough ball and cut it in two equal halves. 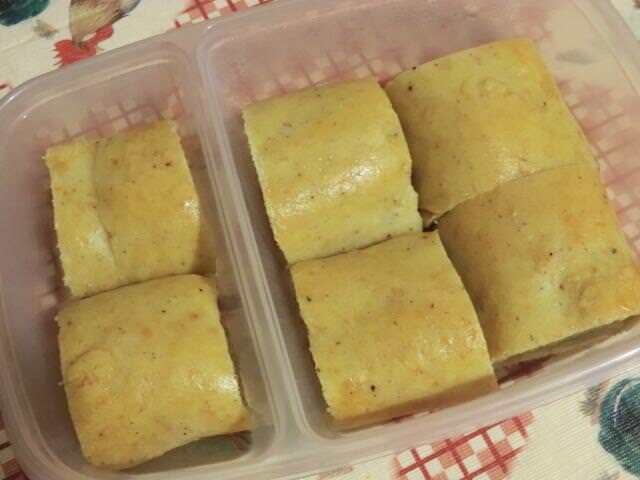 Roll out each portion into a rectangle that’s 1/4 inch thick and about 4 inches wide x 14 inches long. Spoon half the filling into the center of one of the rectangles. Brush some of the egg wash along one of the long edges of the dough and fold other end of the dough over the filling onto the egg washed edge. 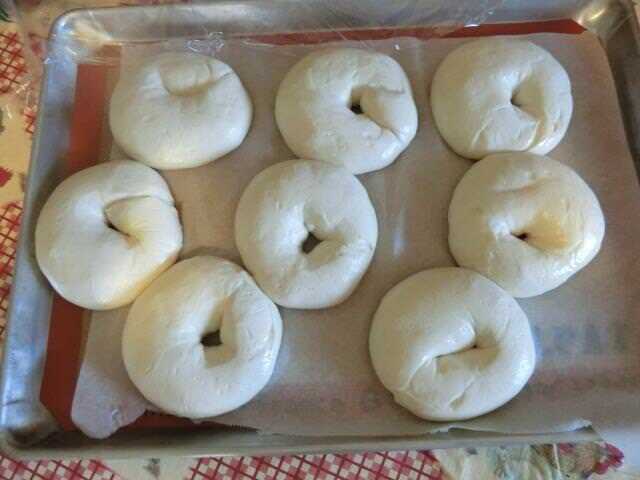 Press the dough down to seal the filling into the roll. 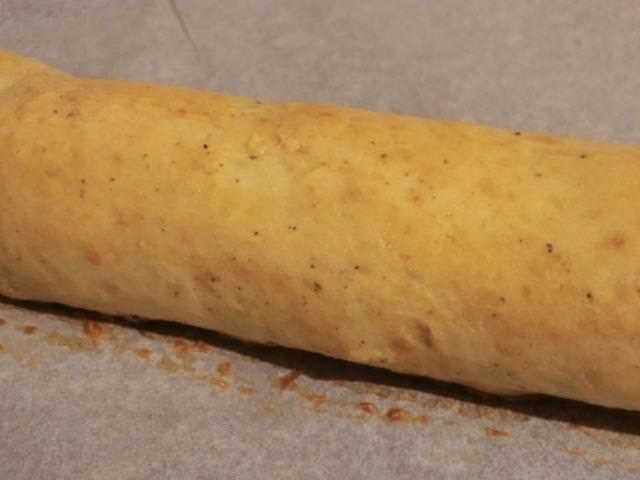 Turn the roll over, so the seam is on the bottom and transfer the knish log onto the parchment paper lined baking sheet. Brush some of the egg wash over the top. 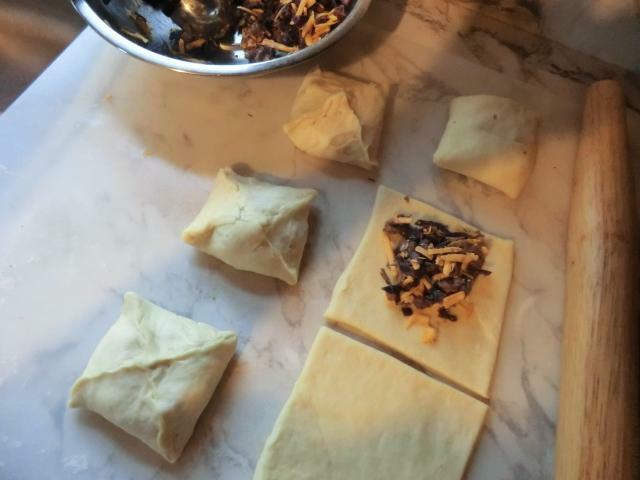 Repeat the assembly process with the rest of the dough and filling. 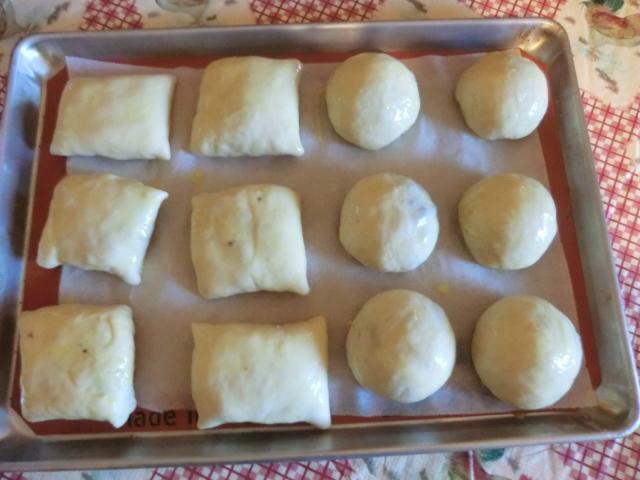 Place the half sheet into the preheated oven and bake for 45-50 minutes or until the top is golden brown. 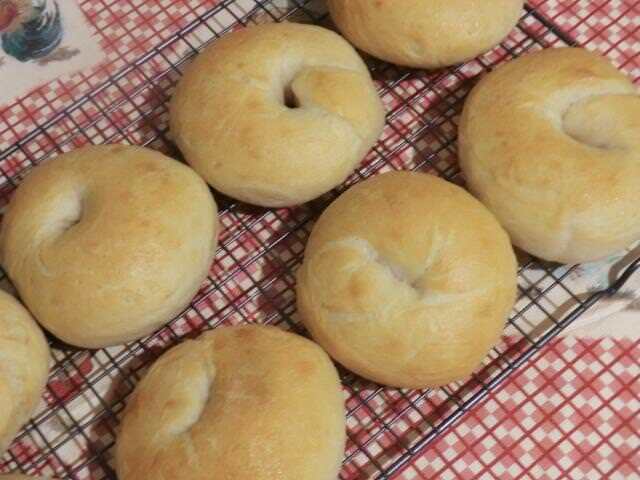 Let the knish cool until it’s barely warm, then cut the knish rolls into 2 inch bars. Serve warm or room temperature with ketchup or spicy mustard. 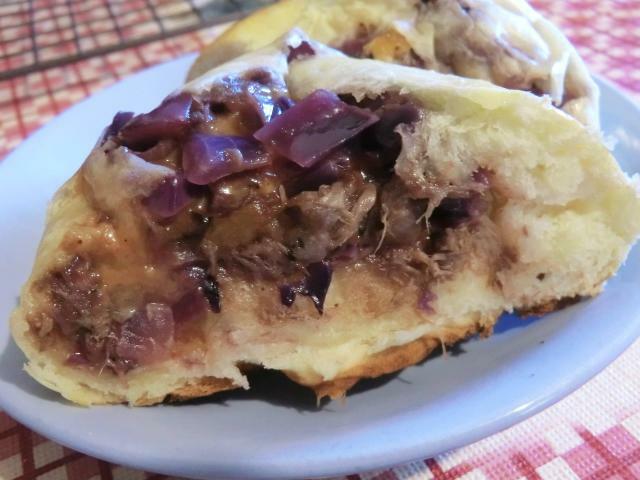 I served my knishes with a couple of slices of meat loaf and found that the sweet, tang of the ketchup-mustard glaze paired well with the heaviness of the knish. 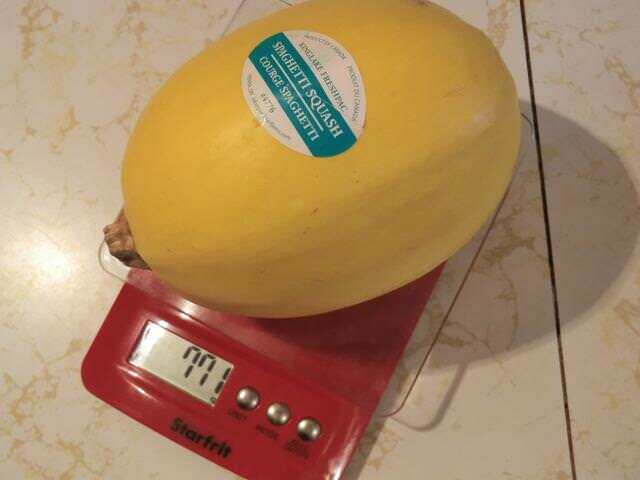 I remember trying spaghetti squash at least five years ago and not being impressed. As I recall, I microwaved the squash and served it very simply with a marinara sauce on top. I thought it was watery and fairly bland. Not really a substitute for pasta, but it was part of my attempt to introduce new vegetables to my diet. 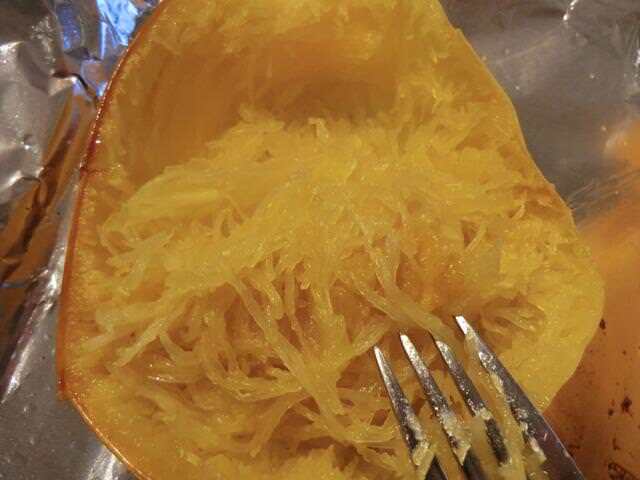 A few days ago, I went grocery shopping and decided to give spaghetti squash another try. I stabbed the small, whole squash (<800 gm) with a paring knife and then par-cooked it in the microwave for 5 minutes. Then I cut the squash in half, removed the seeds, sprinkled it with some salt, and baked it, cut side down, at 375 deg Fahreheit for 30 minutes, until a fork inserted into the squash met little resistance. After letting the squash cool, I used a fork to scrape out the flesh. First impression: The resulting squash strands looked fine but there wasn’t a lot of them. A scant 3 cups, I’d estimate. Of course, I had picked the smallest squash on the pile ($1.49) so you have to take that into account. 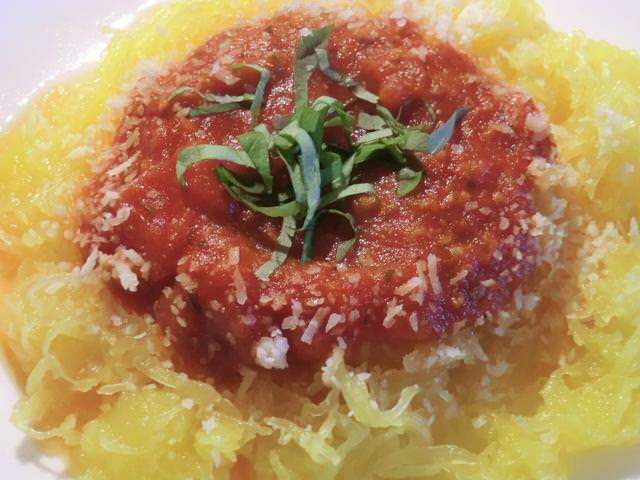 Spaghetti Squash topped with jarred spaghetti sauce (sausage and pepper) – Tasty but still a bit watery. Possible solution is to drain the spaghetti squash strands a bit and make sure the spaghetti sauce is thicker. At least now I know it’s not JUST due to the cooking method ie. 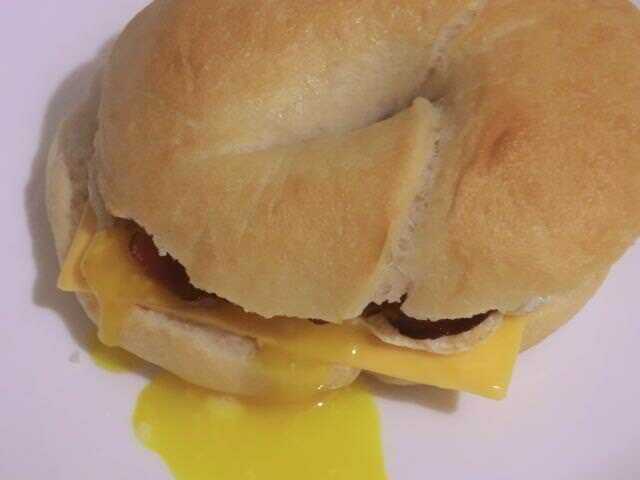 microwaving. Spaghetti Squash topped with cheese, sour cream and chili con carne with beans – After hand squeezing the remaining half of the squash, about 1/4 cup of liquid was expelled. The resulting dish was much less watery than the previous serving with meat sauce. 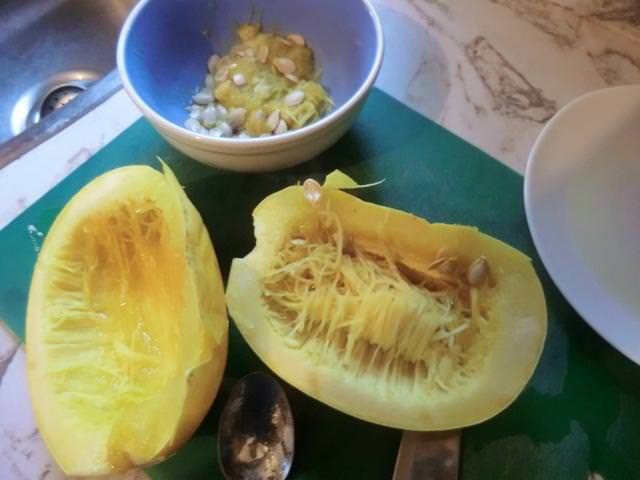 The seeds were picked free of the surrounding squash flesh, rinsed and simmered for 10 minutes in salted water. 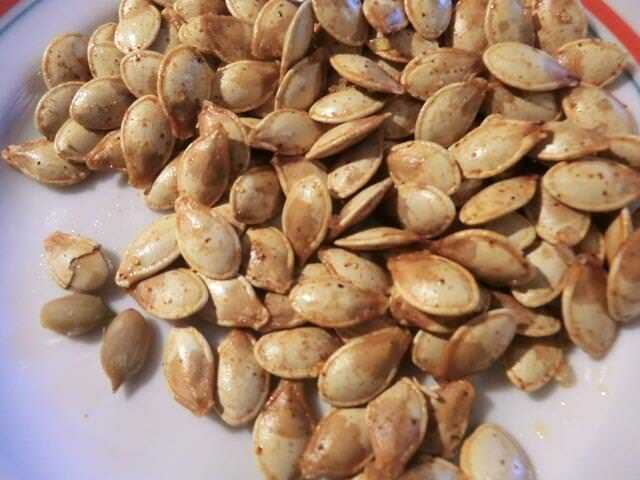 I used paper towels to get most of the water off the seeds, placed them on a baking sheet lined with aluminum foil and drizzled them with a bit of canola oil and sprinkled them with fine sea salt and a shake of paprika. Then the seeds were baked at 350 deg Fahrenheit for 10 minutes, turning them over after 5 minutes, to ensure as even baking as possible.